“That time of year thou mayst in me behold / When yellow leaves, or none, or a few do hang / Upon those boughs which shake against the cold, ” Shakespeare plaintively–or persuasively, depending on your perspective–sonneted on man’s impermanence. But what do we call that time of year? A little late? I know. Most of the leaves have fallen by now–or, in SoCal, most of us have pulled out sweaters for those bone-chilling, 50-degree days. But, each year, as we swap out Satan for Santa, aren’t we always asking ourselves: What ever happened to Thanksgiving? Let’s linger over leftovers and talk about harvest. Or what was once called harvest. This side of the pond, we call the third season of the year fall, as opposed to the autumn of British English. Why did this come to be? Some attribute the difference to the Atlantic Ocean, for both fall and autumn were displacing English’s original word for the season, harvest, in the 16th century, around the time when the British were settling parts of North America. Perhaps certain linguistic idiosyncrasies, such as a preference for fall, settled well. Check out this short Slate article by Forrest Wickman for more on this difference–including a little of bit of British envy. As first attested in 1545, fall appeared as “fall of the leaf,” mirroring the origin of spring (“spring of the leaf”), which I picked apart earlier. You might recognize Latin’s fallere in such derivatives as false, fail, fault, fallacy, or fallible. Falling, deceiving, dying–down is bad. The sun goes down, ushering in nightfall? Bipedal man falls down, causing injury? Observations of the damage–or death–due to gravity? Perhaps these etymological connections lend support to Lakoff and Johnson’s The Metaphors We Live By, in which the authors theorize overarching conceptual metaphors (such as up is good, down is bad) that organize our understanding of our experience–and the language we use to express it. The OED’s earliest attestation of autumn–autumpne–comes from a work of translation by Chaucer in 1374. While its form has shed more sounds than a maple sheds leaves in October, English plucks autumn from Romance names for the seasons: the Old French autompne, in turn from Latin’s autumnus, sometimes documented as auctumnus. The origin for autumnus is not certain. Some have proposed a connection to augere (to increase; think augment), whose past participle is auctus (think auction). This does make some agricultural sense, with the increase of crops’ yield at harvest during fall. Or autumn. Shipley argues for an earlier Latin vertumnus, noting the change from warmth to cold in its relationship to vertere (to turn; think convert, divert, verse, and the many others in the root’s big family). To avoid confusion with the Etruscan god of the seasons, Vertumnus, he continues, the Latin-lipped altered the form of the word. Indeed, the Romans worshipped a god of the seasons, change, and plant life, named Vertumnus, whose altar may have been inspired by the supreme Etruscan deity, Voltumna. 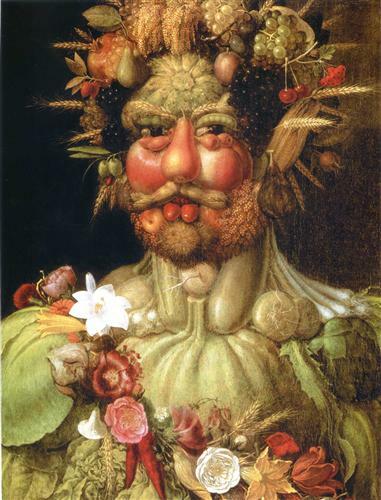 Arcimboldo’s rendering of Holy Roman Emperor Rudolph II as Vertumnus, Roman god of the seasons, change, and plant life. Ca. 1590-91. Autumn may be Etruscan in origin, but the connection between Voltumna, vertere, and autumn is probably due to folk etymology. In folk etymology, the form or sound of a word, particularly a foreign or obscure word, is changed to accord with ostensibly commonsensical, though mistaken, connections to known words. Click the link for some fun examples of folk etymology. While the relationship between autumn and augment may be unclear, it does point us to harvest, which, in the form of haerfast, named the season between summer and winter as bar back as 902. Harvest may once have encapsulated the entire season, but, with rise of fall and autumn, it narrowed to refer to “the time of gathering of crops,” as the Online Etymology Dictionary puts it, then to the action of gathering, and, yet later, to the product of gathering. I think etymology helps us to do this stepping back. The origin of words like fall and harvest have an immediacy, a salience, a simplicity, or a literalness that all of our myriad, modern goings-on seem to cloud up. Leaves fall.mCrops ripen. Crops are picked. Life. Death. Nourishment. Change. Interesting! The Irish word for autumn is fómhar, which means harvest. Meán Fómhair and Deireadh Fómhair are September and October respectively. They mean middle of the harvest and end of the harvest. I wondered wihether the Irish could just be a calque based on the English usage. However, I checked it on eDIL. The word fómhar (fogamar) seems to be a very ancient term for the season of autumn in Irish and means sub-winter. In other words, it looks as if the season was named for the harvest in English (but not now with fall and autumn), while in Irish the harvest is named for the time of year just before winter. Fascinating. Linguistically speaking, and I would have extrapolate, culturally speaking, “summer” and “winter” seem to present the most widespread seasonal distinctions, there being far less pervasive Indo-European terms for “spring” and “fall.” There are oh-so many variables (and thus assumptions) at play to explain this. But the “under-winter” of Irish lends some support to the linguistic priority placed, for whatever reason, on the summer/winter division. I think that’s correct. There are two elements which are roughly sam and gam in Old Irish, one the orign of samhradh (summer) and probably the origin of Samhain (end of summer) and the other the element in fogamar and in modern Irish geimhreadh (winter) and (I was once told) cognate with the hima bit of Himalaya. I suppose to hunter/fisher gatherers the hot time of year and the cold time are relevant but spring and autumn only become important with widespread use of agriculture, as they mark planting and then harvest. We will never know with certainty, but I can only imagine that climate and means of subsistence necessitate different seasonal language. What does the “radh/readh” or “hradh/hreadh” (don’t know the division in Irish) signify? Apparently it comes from ráithe, which means a period of three months. Our phone bill is a bille ráithiúil in Irish, a quarterly bill. This in turn is related to the word rith (or is thought to be, anyway) which means ‘to run’ and has lots of IE cognates. Which suggests that the other seasons have been used and recognised since the forms geimhreadh and samhradh have been around – otherwise they would be six-month periods, not three-month!